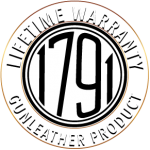 At 1791 Gunleather, we take great pride in the quality and craftsmanship of our products. Attention to design, materials, and construction is our priority. We are happy to assist with returns due to damaged or incorrectly shipped products that are reported within two weeks of receipt. If for any other reason you are not satisfied with your purchase, a return authorization must be requested. Credit for authorized merchandise that is returned in the original condition and packaging will be issued upon receipt and inspection. Unauthorized returns of any kind will be returned to the customer at the customer’s expense. You may return most new, unopened items within 30 days of delivery for a full refund. We’ll also pay the return shipping costs if the return is a result of our error (you received an incorrect or defective item). Provide your order number, contact details, type “Return” in the Subject field and include the reason for the return in the Comment field. Our Customer Care team will review the request and contact you with your return number (RA#) and include specific instructions on where to send the product.